In my journey as a food blogger, this is my debut effort in a fun online food event – and it makes this recipe a little special. Dimple tagged me in this event and I decided to participate to celebrate the foodie spirit! Thank you Dimple 🙂 This event is being conducted on CAL (Chef at Large). The topic was accompaniments – more specifically to share a raita recipe of my choice. 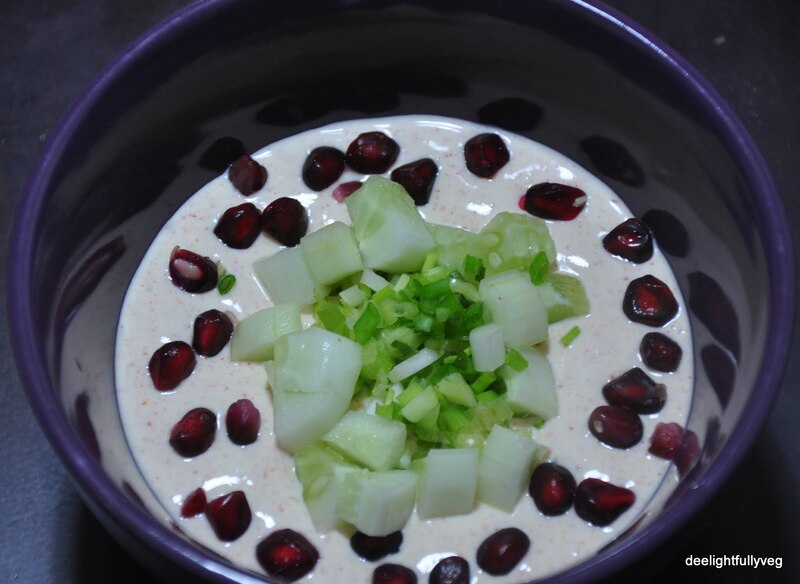 Raita is nothing but a yogurt based salad which contains vegetables or fruits of your choice. It works well with roti or rice and requires very little prep time. I could manage making it on a weekday :). Cucumbers are the most commonly used vegetables along with yogurt and I decided to stick with them. The fun came in choosing my other ingredients to match the cool cucumber and give it a nice spin. I chose spring onions to add more greens and spice. Finally, to play with the colours and natural sweetness, I added pomegranate seeds. If you try this combination, you are going to end up with a spoonful of healthy, crunchy and delicious meal accompaniment. Take the yogurt in a bowl and whisk it till smooth. Now add the red chilli powder, sugar, salt, coriander powder and chaat masala. Whisk it till the spices blend into the yogurt. Ensure that there are no lumps at the end of this stage. Add the cucumbers and spring onions and gently stir into the yogurt. Garnish it with pomegranate seeds. Refrigerate it for an hour before serving. Enjoy! Avoid using yogurt that is too sour in taste or extremely liquid in consistency.